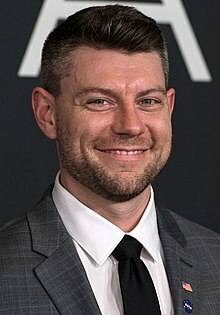 Patrick Raymond Fugit (/ˈfjuːɡɪt/; born October 27, 1982) is an American actor, known for his roles in the films Almost Famous (2000), White Oleander (2002), Saved! (2004) and Wristcutters: A Love Story (2007). Since 2016[update], he has starred in the Cinemax series Outcast. Fugit was born in Salt Lake City, Utah. His mother, Jan Clark-Fugit, is a dance teacher, and his father, Bruce, is an electrical engineer. Fugit is the oldest of three children, he has a younger sister and a younger brother. Fugit attended East High School, where he was diagnosed with ADHD. Fugit appeared in a school production of The Twelve Dancing Princesses as the shoemaker, while he was at grade seven. He has been a skateboarder since he was fifteen. Fugit and his best friend, David Fetzer, formed a folk/rock band "Mushman", in which Fugit plays the guitar and sometimes sings. Fugit studies flamenco guitar, which he played on the Cavedoll song "MAYDAY" and his song "Brennan's Theme" for the ending scene in Wristcutters: A Love Story. Fugit played a young rock-fan-turned-reporter in Cameron Crowe's Almost Famous and claimed that his knowledge of 1970s rock music was nil ("I actually thought Led Zeppelin was one person"). Fugit played a sweetly geeky, aspiring comic book artist in White Oleander (2002) and a naive drug addict in the indie dark comedy Spun (2003). His next film, Saved! (2004), was a satirical look at the religious right in high school. Fugit's character was originally a surfer, but it changed into a skateboarder due to his skateboarding experience. Fugit starred in The Amateurs and played Evra Von in Cirque du Freak: The Vampire's Assistant (2009). In 2016, he joined the cast of Cinemax's television series Outcast. 2006 House Jack Walters Episode: "Whac-A-Mole"
^ "Star Wars Memories: Patrick Fugit". EPN. December 17, 2015. Retrieved May 31, 2018. ^ Patrick Fugit Biography – Yahoo! Movies. Movies.yahoo.com. Retrieved on 2012-05-06. ^ a b Saved Movie – Patrick Fugit and Heather Matarazzo Interview. Movies.about.com (2012-04-13). Retrieved on 2012-05-06. ^ Saved Movie – Patrick Fugit and Heather Matarazzo Interview. Movies.about.com (2012-04-13). Retrieved on 2012-05-06. ^ Punch Drunk Critics. Punch Drunk Critics (2010–11). Retrieved on 2012-05-06. Wikimedia Commons has media related to Patrick Fugit.